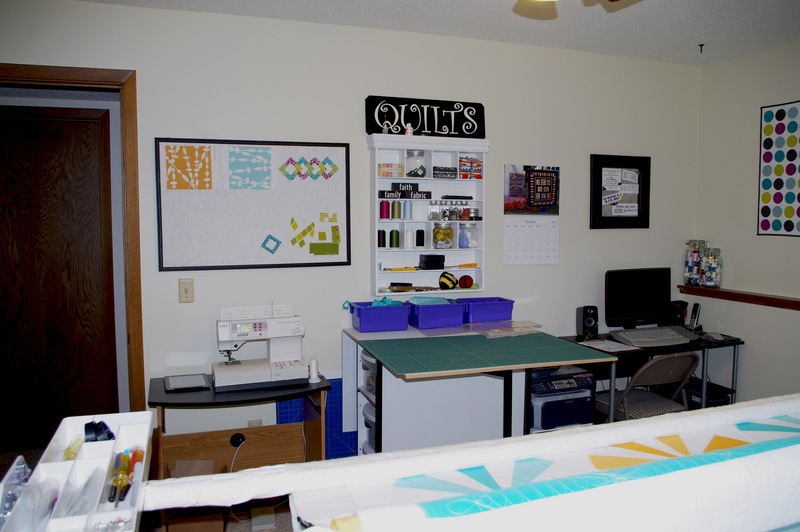 Spoiler Alert: This post is filled with pictures of my quilting room! 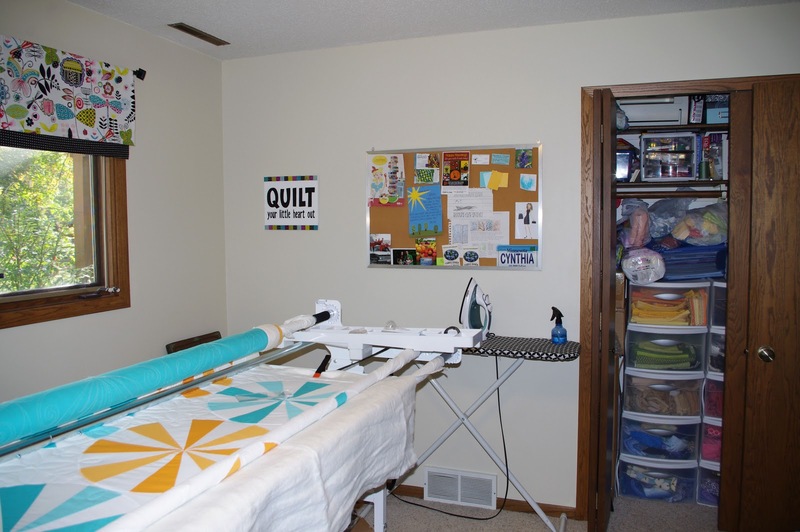 I recently gave my quilting room a really good cleaning (there was vacuuming involved, so you know it was getting serious)! 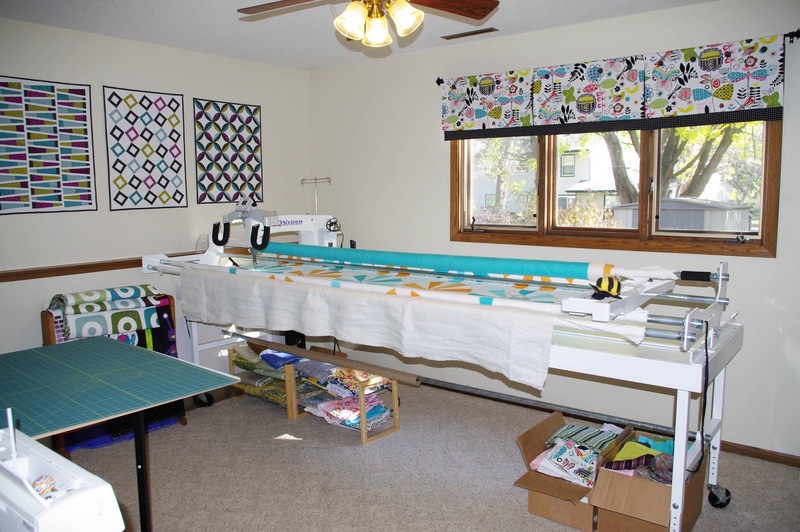 I thought it would be a good time to take pictures so I can remember my little Minnesota quilting room forever--I will be so sad to leave it in a few months when we move! Earlier this year my husband went out of town on business. I was so excited. I love my husband, but sometimes it is nice to have several nights in a row to just get some quilty projects done without having to worry that he'll think I'm neglecting him. I had big plans. I had just finished making a bunch of quilt tops and I was ready to take a break and do some actual quilting. So the first day he was gone, I turned on my quilting machine and quickly discovered that I wouldn't be doing that quilting anytime soon. I've had my machine for 3 years and never had a problem, but with any machine...it was inevitable. Luckliy, I wasn't working on anything with a deadline. I quickly made a call and found out I'd have to send in some of the parts for my machine and I wouldn't have them back for a couple of weeks. So I booked it over to UPS and got them sent off. Then I sulked for at least an hour. All my big plans were ruined. Finally I decided I might as well do something constructive. That night I made my daughter a nightgown that I had been meaning to make for months. Yay. But with that done I still had 2 more days that my husband would be gone...and I was burned out on piecing. I started thinking about what I would do for 2 or 3 weeks without being able to actually finish a quilt. So then I got the most brilliant idea ever! 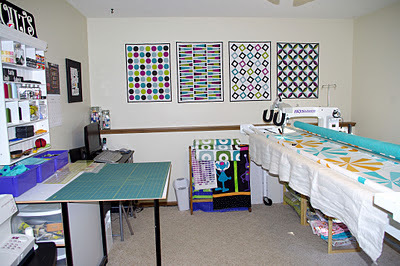 I would give my quilting room a makeover!! We'd lived in this house for 3 years and I had never changed the decor from the previous owner...lemon yellow walls (it looked neon yellow in some lighting) and a valance that reminded me of a circus tent (mostly because of the shape). Plus, it was a giant mess...it really needed a good cleaning. The time had come...it had to be done. Of course I needed to buy some fabric for this...I had to make a new valance, etc...so I shopped online and planned for 2 solid days. Monday morning, I went to the paint store and got paint, moved everything around and had the room painted in a few days. Then it was time to accessorize...so here are some pictures. I've included a couple of "before" pictures because it makes the "after" pictures look so much more amazing. What? You thought I was kidding? It was a GIANT mess. And please note the circus tent valance--it's kinda hard to tell from the picture, but it stuck out about 6 inches from the wall! ...the piles of junk stacked everywhere. The first thing I did was make a new valance....I totally love it...I think the fabric is so happy and fun but it has certainly gotten mixed reviews (I'll let you guess who definitely doesn't like it). 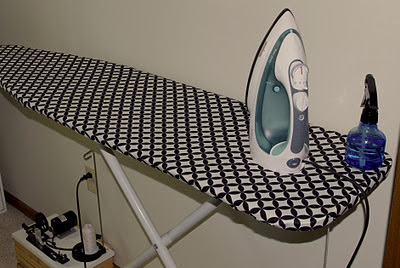 The fabric is June Bug by Alexander Henry and the black dots are from the same line. 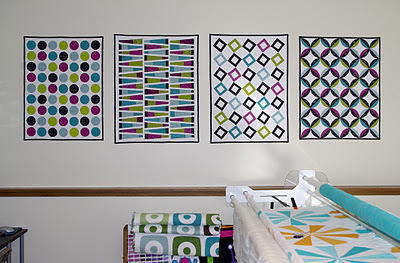 And here's where my small quilts ended up...this wall was begging to have some mini quilts on it so I made these four (see these posts (L-R): circles, wedges, squares, peels). I obviously needed some organization for all my quilting supplies. I thought about making an organizer I saw in a magazine but then I was looking online and I saw this sweet scrap-booking embellishment center. I knew it would be perfect to hold all my little tools and notions...so I shimmied on down to Michael's the next day and bought one on sale! I absolutely love it! It holds tons of stuff. The little jars are sold separately, and it does come with little rods to hold ribbon, but I just left those out. I decided the room needed a little flair so I made these blocks. On the other side they are different colors and say something else...they were given to me as a gift but were still sitting in a cupboard, package unopened...so I pulled them out, flipped them over, and used vinyl stickers I found at Hobby Lobby to make them say something more appropriate for the space. I finally hung up my cork board...that's where I put all my coupons and inspiring pictures, etc. And I made this little sign...I've been wanting to do this one for sometime. My husband gave me a quilting magazine subscription for our first Christmas (before we got married) --since you can't really wrap something like that he printed out a picture of the magazine and next to it he wrote "so you can keep quilting your little heart out". 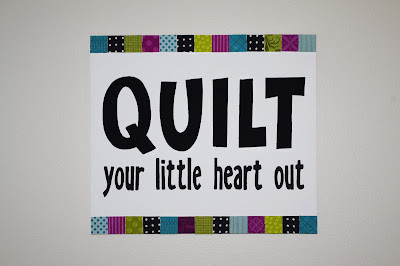 So I made this sign to remind myself (and my husband) that he encourages my quilting addiction! I was so pleased with my resourcefulness on this sign..I used a piece of an old desk that was lying under my quilting table...painted it with acrylic paint and used fabric and liquid starch for the "quilt" letters and the border. Easy. I figured that since I was getting all crazy I might as well get a new ironing board cover too-- I found this one on etsy. And then I pretended to organize my closet...it still needs work. This shelf is sitting on the floor in a corner...not visible in any of the pictures. 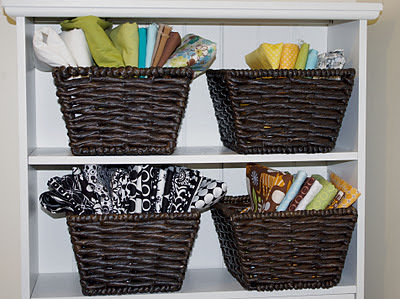 The fabrics in these baskets are just dying to become quilts! I love to pull stacks of fabric from my stash when I get an idea for a new quilt...but usually it is a while before I get around to using them--but I don't want to put them away (I want to keep looking at them so I don't forget about them)...so in the past they have been left on the cutting table, or the quilting table. And then they get stuff stacked on top of them, and it just adds to the general disarray that is my quilting room. So now I keep the fabrics for my next few projects in these little baskets. 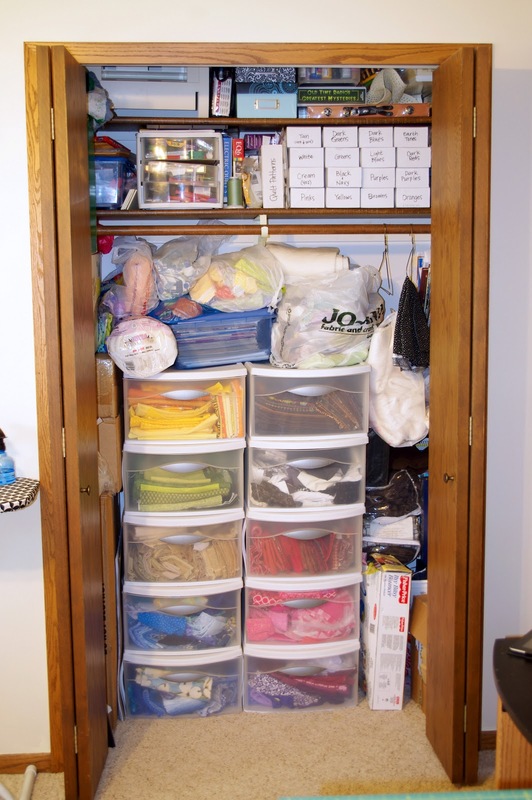 The last thing I did was make a rule for myself that I would clean my quilting room every time I finish a quilt. I am super awesome at making exceptions to this rule, but so far I'd say it's working...the room is clean right now! I loved this post!! I adore seeing other quilters' creative spaces. Did you give the circus tent valance a proper send-off/burial? Because dang that thing was....interesting! LOVE, LOVE, LOVE !!! !I am 100% jealous . I love the way it came out so bright , colorful and cheery. I think this is my favorite quilting space I have seen online. I am going to bookmark this page and just hope one day I have a room at least half as beautiful as yours. First I have to wait till one of my children moves out, not to far away though ,they are 17, 18 & 19. 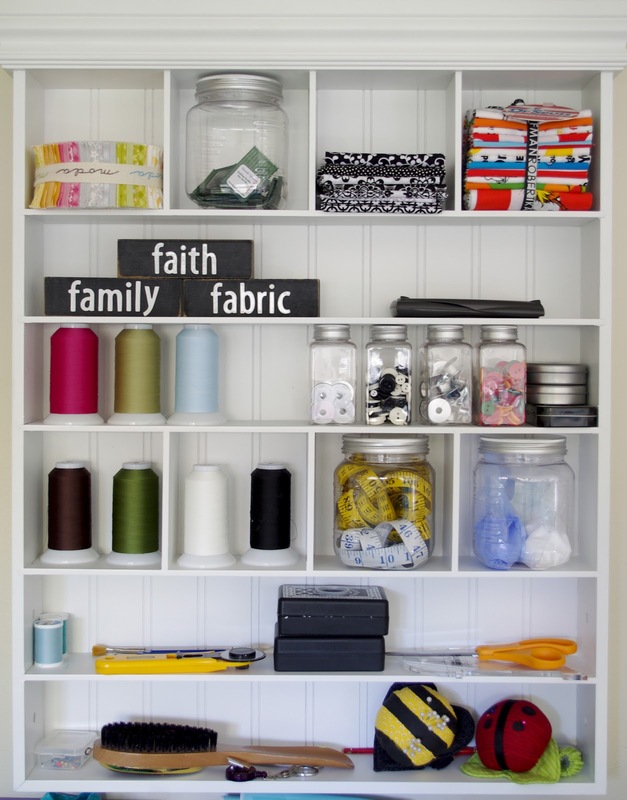 Your sewing studio looks amazing!!! I know who probably doesn't like your valance. I have one of those people at my house! LOL! I love it! Wow! Love this. 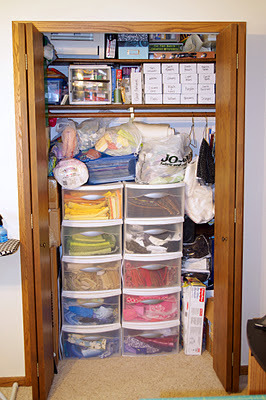 I've been looking for something to store my thread cones in without using one of those thread racks. 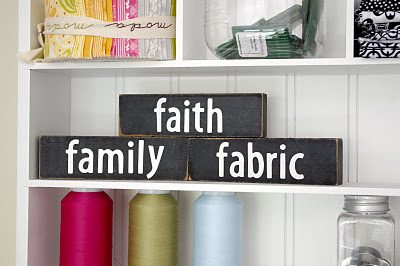 Love the shelf unit, seen them at Michael's, love that idea, hope you don't mind if I "borrow" that one. 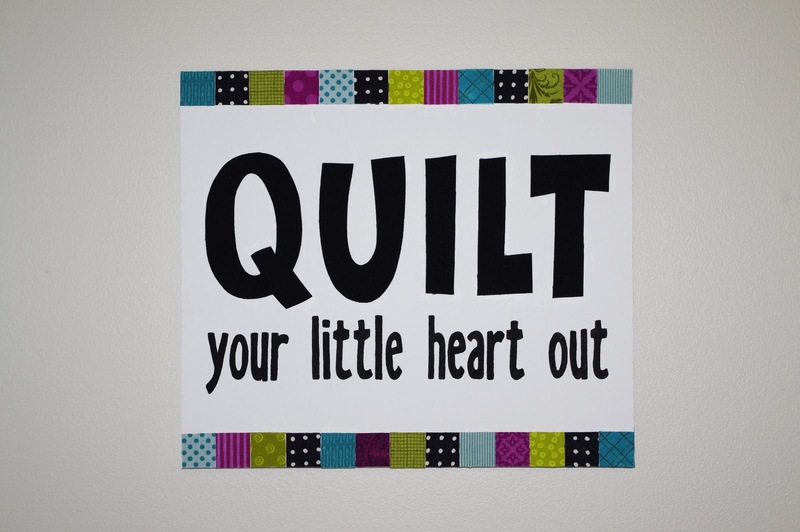 Love the mini quilts. Never said so I must ask what color did you paint the walls? Doesn't that feel good!! I did that to my studio pit a while ago and it was the best thing I did!! Great transformation!! 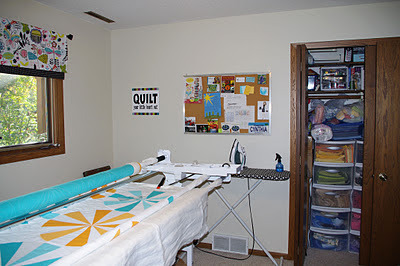 With a fresh cleaned up and spruced up space will come some fresh new quilting ideas too! The room didn't look that messy before LOL,. but it looks great now. 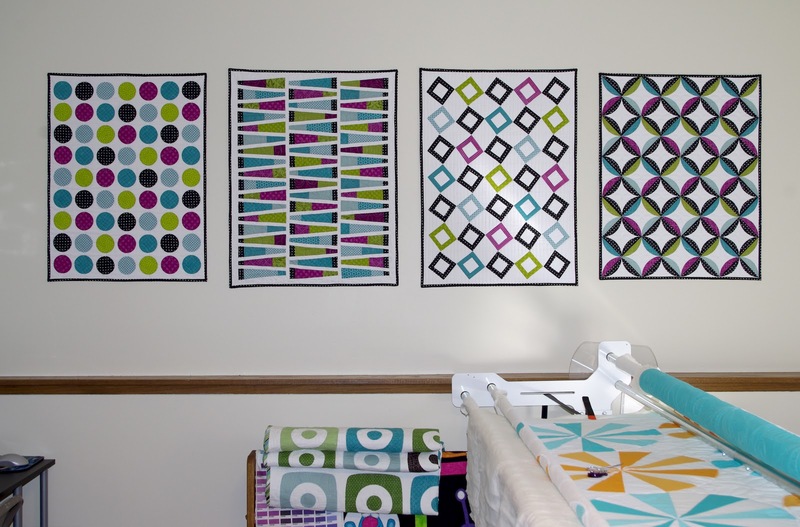 The quilts on your wall and the cork board all add so much color. I like your valance. 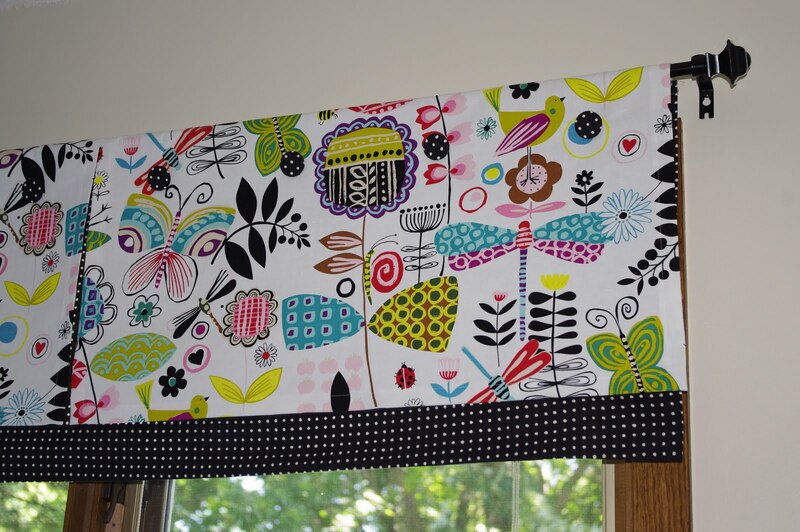 (I had one of those circus valances too). 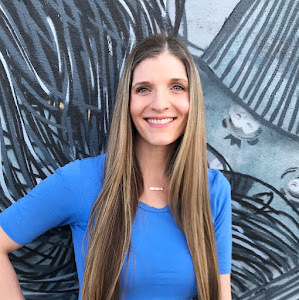 Excellent makeover, thanks so much for sharing the before and after pictures. 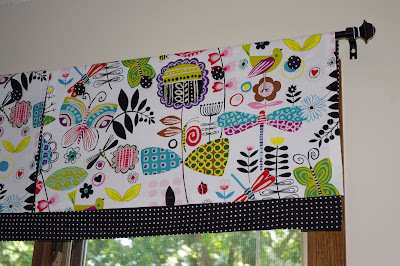 I love the happy valance and little quilts on the wall.